Walls are a critical structural component in any structure. Building codes require that walls resist wind pressures and wall-racking forces and provide weather protection. Wall sheathing is essential to the structural integrity of a home. Structural wood panel sheathing contributes to the structure's ability to handle uplift loads, lateral loads and wind pressures while providing secure connection to the roof and protecting the occupants. Fully sheathed wood walls solve a majority of building challenges by delivering multiple advantages in code and safety, design and production, and energy efficiency and green building. Builders and designers can choose from a variety of wall sheathing products and wall systems. The sections below offer information on several commonly used wall systems and details on how wood structural panels can be used to meet fundamental requirements in wall applications. 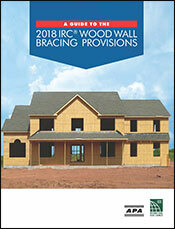 Available on ICC's website, this book details lateral bracing provisions of the 2018 International Residential Code. 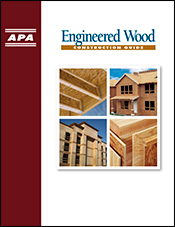 Wall Construction, excerpted from APA's Engineered Wood Construction Guide, Form E30, gives construction recommendations for several wall assemblies.